The office of Sheriff dates back over 1000 years to early England. The office came to the American Continent with the first settlers. Although the image has changed, many of the duties remain the same. 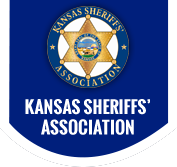 In Kansas, the office of the Sheriff was established before Statehood was achieved. In some areas of Kansas Territory, the Sheriff was the only law enforcement. In 1855, General Statutes for the Territory of Kansas set the procedures for electing a Sheriff. When Kansas became a State in 1861, the office of Sheriff was among the first established. The Sheriff is elected by the citizens of his/her county for a four year term. The Sheriff of today is in charge of a modern, full service law enforcement agency. In some of the less populous counties, the Sheriff may provide the only law enforcement to the citizens, while in the metropolitan counties the Sheriff's Office is a large agency offering valuable full service law enforcement. KSA supports legislation that is beneficial for the community safety and security. KSA financially supports scholarships for high school graduates to attend colleges or universities of their choice. KSA supports training sessions throughout the year in which law enforcement officers become familiar with new laws and techniques to enhance their effectiveness in their duties.